Surf and Sand OceanFront is located "on the sand" of St. Augustine Beach, the most beautiful beach on Florida's Atlantic coast. Direct oceanfront, watch the sunrise over the beautiful Atlantic Ocean from our oceanfront deck! Surf and Sand OceanFront is located in the heart of St. Augustine Beach and near all of the"Old City" St. Augustine historical sites. With its perfect oceanfront location, you will be near lots of things to do either right outside your door or close by. Frequent visitors to the area know the importance of not being stranded on some remote beach miles from everything the area has to offer! Surf and Sand OceanFront is one of the few rental properties actually located in St. Augustine Beach! AND has the BEST location in town with 5 restaurants, trolley to town, surfboard, bicycle and kayak rental all within one block! 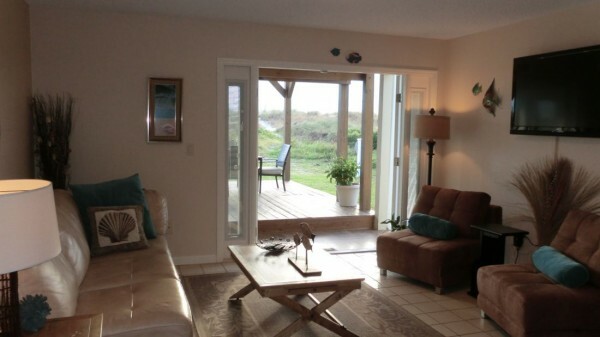 In a beautiful oceanfront setting, Surf and Sand is a duplex townhouse which is only rented as one large house. It has a total of 4 bedrooms, 4 bathrooms, 2 living areas with convertible beds, 2 dining areas, 2 kitchen areas, and 2 HUGE oceanfront decks. It sleeps up to 10 guests, and has ample parking for up to 4 vehicles. Surf and Sand Oceanfront is the Best House on the Beach! Surf and Sand Oceanfront is a two story side by side oceanfront duplex comprised of two mirror image units. Surf is the north unit, Sand is the adjoining southern unit. Both have living areas on the ground floor and upstairs bedrooms. 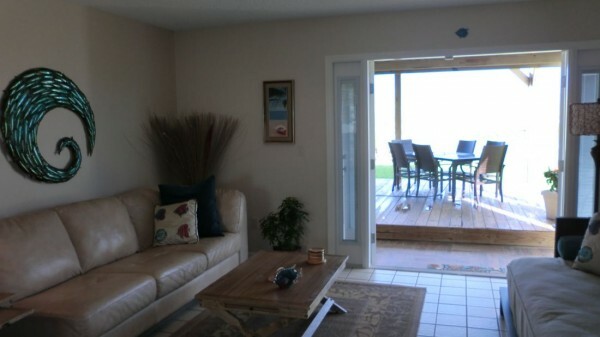 Both are oceanfront and both enjoy 2 HUGE oceanfront decks. 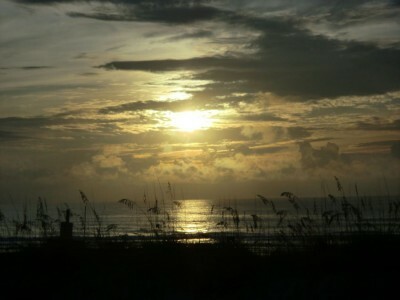 Surf and Sand Oceanfront is located in the very heart of St. Augustine Beach. It's location is the best in the entire area with restaurants, surf shops, live music and the trolley into town, all within one block of the house! 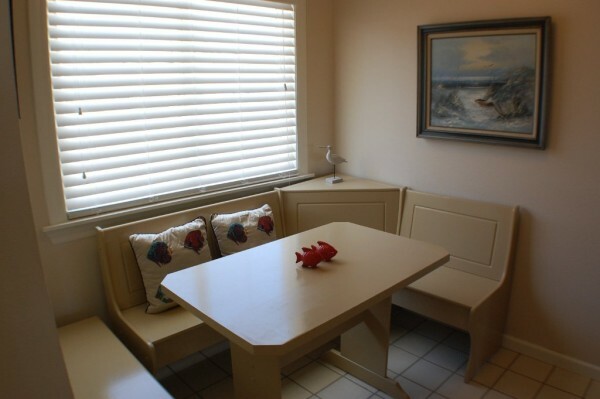 The Sand unit at Surf and Sand OceanFront Beach Rental has a living area, full ktichen, dining area, 2 bedrooms, 2 bathrroms and 2 oceanfront decks. The Sand living area includes large seating area, large sofa, two chairs that convert to twin beds and a 47 inch TV. The dining area seats up to 6 and is located off the kitchen or enjoy dinner on the deck!!. There is one full bath with shower on the upper floor and a split bathroom on the ground floor. Ground floor facilities include separate toilet/sink room. 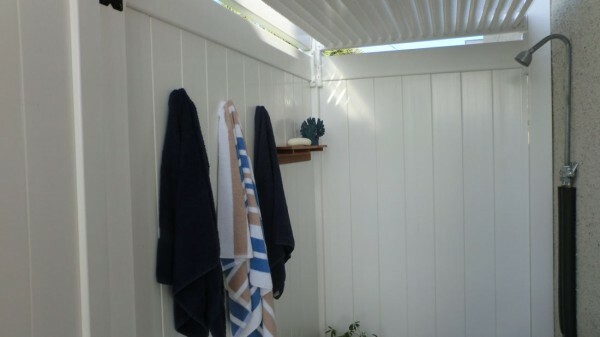 Both units feature private exterior beach shower/changing rooms with hot and cold water for maximum guest comfort. 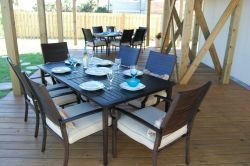 The large oceanfront dune deck is off the living area and has additional seating for up to 10 for those sultry dinners on the deck prepared on the nearby barbque. There are two bedrooms on the 2nd floor. 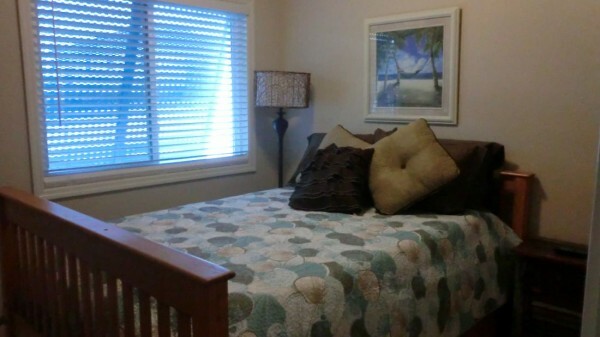 The master bedroom has a king size bed and lounging sofa The guest bedroom contains a queen bed and lower trundle. All bedrooms have flat screen TVs. There are two large oceanfront decks on the lower and upper floors. The lower deck adjoins the living area and upper panoramic deck has incredible ocean views for miles. The washer and dryer are in the utility room on the ground floor. Living area opens onto OceanFront Dune Deck! 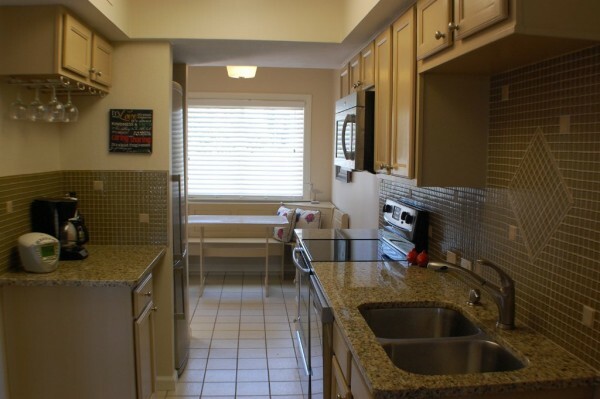 Designer Kitchen, Stainless Steel Appliances, Granite Countertops! 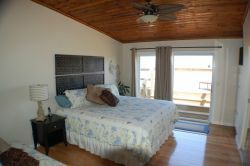 Master Bedroom with King Bed Opens onto Oceanfront Panoramic Deck! 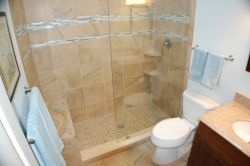 Designer Bathroom with Dual Shower Heads! Wonderful Private Shower with Hot and Cold Water to Wash Off the Sand! The Surf unit, at Surf and Sand OceanFront, adjoins and is almost a mirror image of the Sand unit. 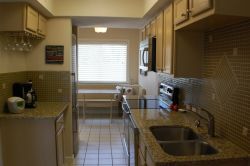 It is comfortably furnished and has all of the same amenities and rooms listed above, but with a slightly different kitchen layout. 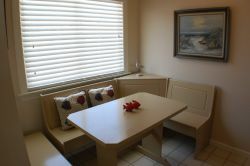 The Surf unit also sleeps up to 6 guests. Comfortable Living Area with Coastal Cool Furnishings! 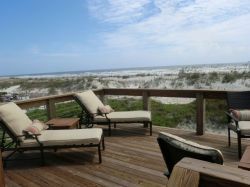 Large Oceanfront Dune Deck off Living Area! Living Area also includes two IKEA Convertible Sleep Chairs and 47" Flat Screen TV! 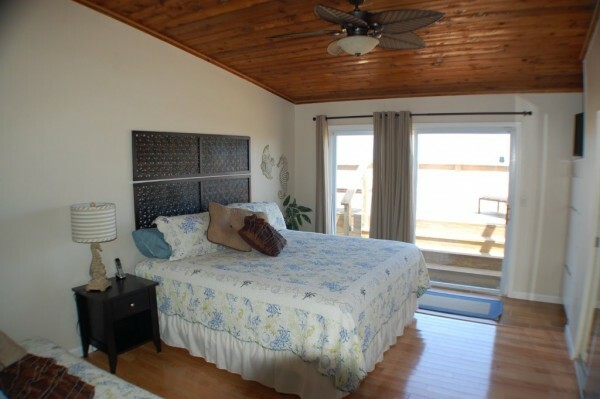 Large King Bedroom opens onto Oceanfront Panoramic Deck! 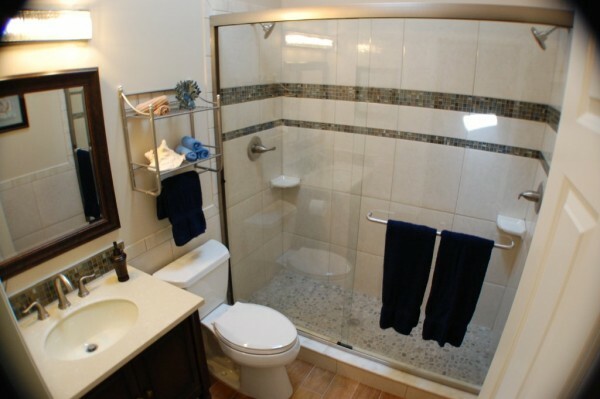 Modern, Designer Bathroom with Granite seating in Shower! Queen Bedroom with Lower Trundle for additional Sleeping! Oceanfront Decks What a View! Surf and Sand Oceanfront has 2 HUGE oceanfront decks on two levels. Located on the upper level is the panoramic oceanfront deck with stunning, unparalleled views of the ocean and surrounding area. The oceanfront dune deck is located on the first level off the living area, perfect for outdoor dining or early evening cocktails! Gorgeous Sunrise from the OceanFront Deck! HUGE Panoramic Deck with Stunning Views! HUGE OceanFront Dune Deck Ready for Cookouts and Games! 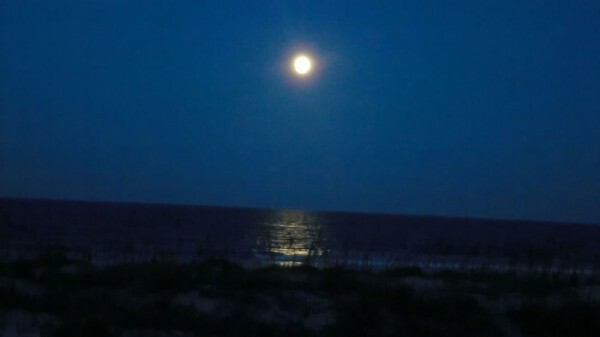 Watch the moon rise over the ocean! 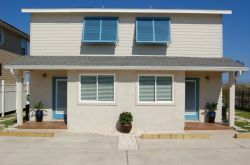 Surf and Sand OceanFront Beach Rental can accommodate up to 4 vehicles. We provide all linen including beach towels as well as beach chairs, beach umbrellas and beach toys for the children. There is also a barbeque grill (charcoal) available for the use of our guests.